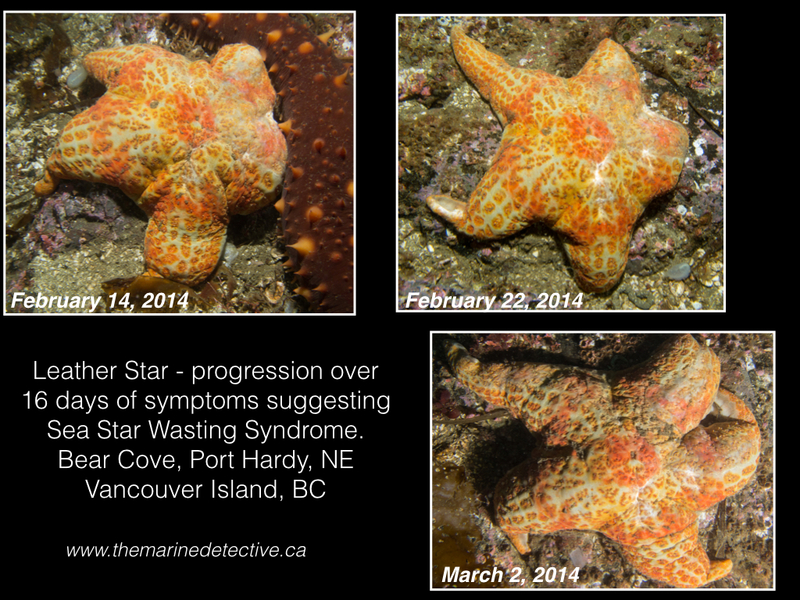 I am very sad to report that Sea Star Wasting Syndrome is now on NE Vancouver Island. 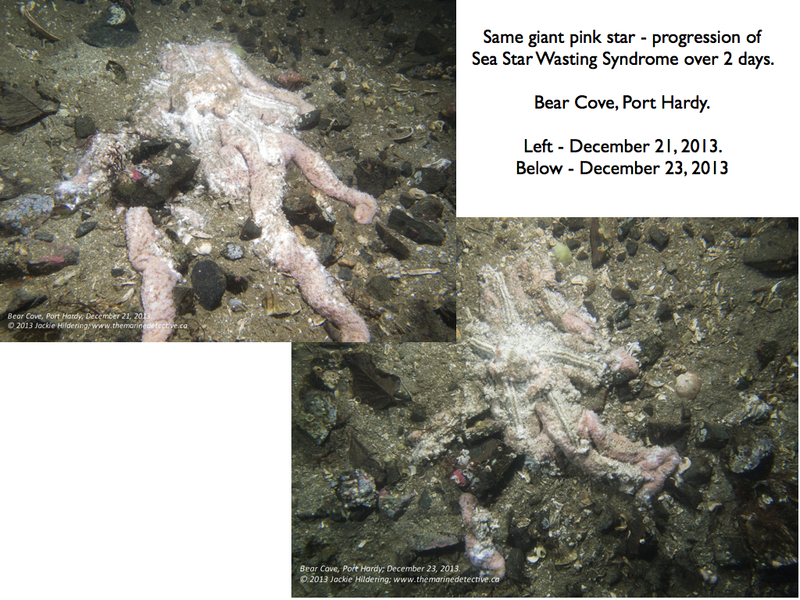 I first detected symptoms of the Syndrome at Bear Cove in Port Hardy on December 13th. Please see table at the end of this blog for how the species affected appears to be quite different from further to the south. Leather stars seem particularly affected and the Syndrome appears to advance much more slowly. I have tried to think up a terrestrial analogy for what is happening to the sea stars so that non-divers might better get a sense of the weight and ecosystem importance of it. However, I can’t come up with a good terrestrial equivalent of an abundant group of highly visible, apex predators. My best attempt is to suggest you think of sea stars like birds of prey. Imagine what you would feel like if you were to notice they were dying, bodies deflating . . . then melting away and that this would progress very quickly and spread like wildfire. 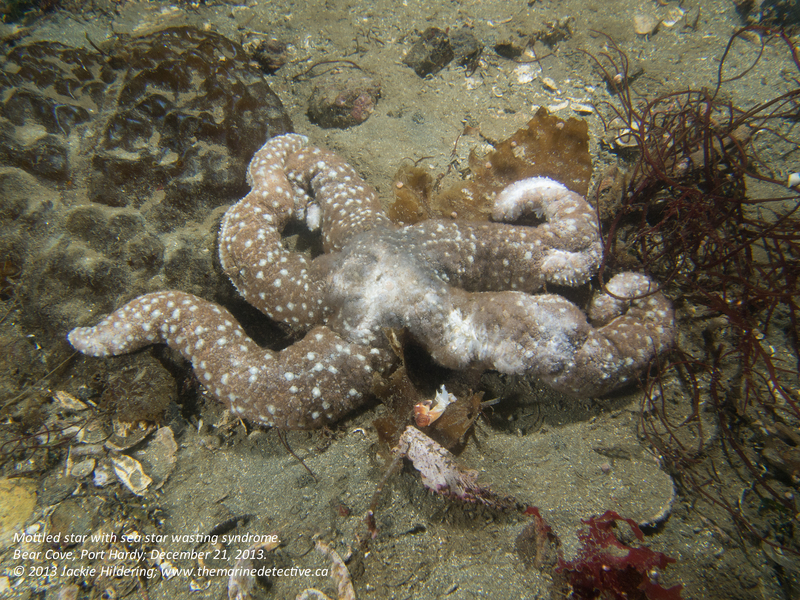 Please see my previous blog item, “Wasted, What is Happening to the Sea Stars of the NE Pacific Ocean?”, for great detail on the symptoms, species impacted further to the south, spread of the Syndrome, and how to help understand what is happening by relaying data to the Vancouver Aquarium. 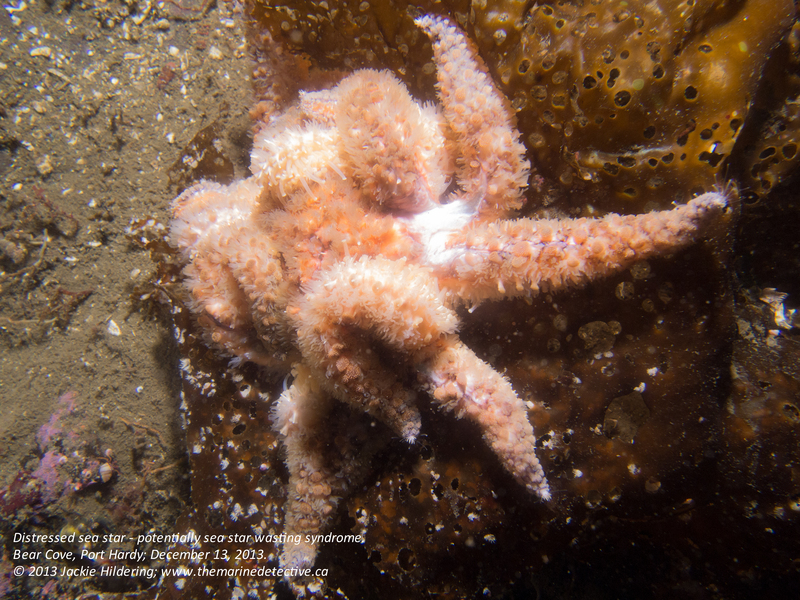 The meltdown of sea stars was first detected in June 2013 in Washington State in ochre stars and in sunflower stars in Howe Sound (BC) in late August 2013 but has now been reported at sites from Alaska to the Mexican border. Sunflower star in distress – potentially wasting syndrome. (Click to enlarge.) Photo from a week ago. Bear Cove, Port Hardy; December 13, 2013. The number of sea stars impacted is orders of magnitude greater than any previous known outbreak. Most likely due to a pathogen (virus and or/bacteria). Cornell University is doing the genomic work. Toxins and environmental conditions have not been ruled out as the cause (or compounding factors). If it is a pathogen, how quickly it spreads is influenced by the number of animals and if they are stressed. There are likely to be layers of stressors. It has put forward by the scientific community that this could be a normal mechanism for overpopulation in sea stars. 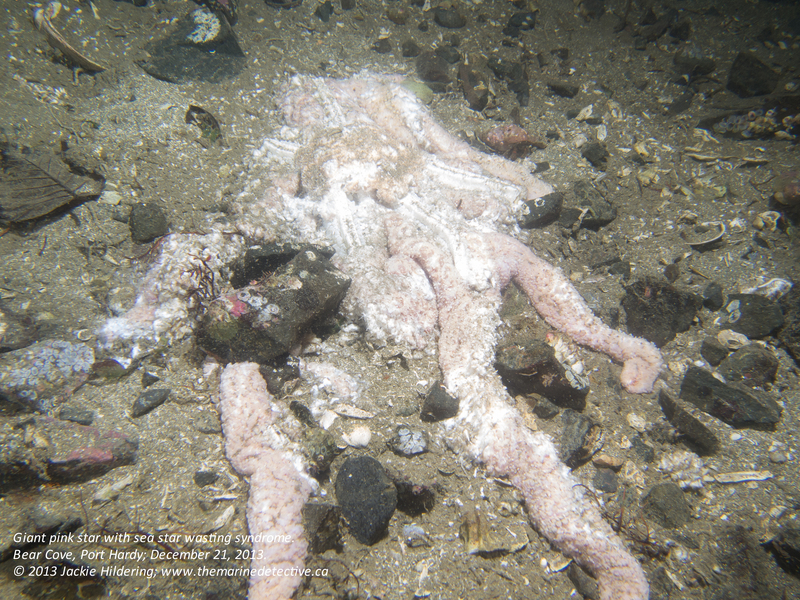 While radioactivity certainly is an environmental stressor, the Fukushima Disaster has not been implicated in Sea Star Wasting Syndrome – really! From a January 30, 2014 Earth Fix article “scientists see Fukushima as an unlikely culprit because the die-offs are patchy, popping up in certain places like Seattle and Santa Barbara and not in others, such as coastal Oregon, where wasting has only been reported at one location.” (Also see January 19th, 2014 article “Half-Lives and Half-Truths – Discovering the truth about five of the most widespread myths of the Fukushima disaster” and scroll to the sources at the end of this article for scientific papers on the potential impacts of Fukushima). The 1-minute time-lapse video below shows the progression of the Syndrome in a sunflower star over 7 hours. However, I believe very strongly that, in attempting to raise awareness about marine environmental issues, I must always reflect on “what you can do”. If I do not, I contribute to the spread of a devastating human syndrome: Eco-paralysis. Symptoms include people becoming despondent, overwhelmed, and underactive in undertaking positive socio-environmental change, and often saying “It’s all hopeless”. The cause? This I do know. Eco-paralysis is the result of not seeing the common solutions between environmental problems. 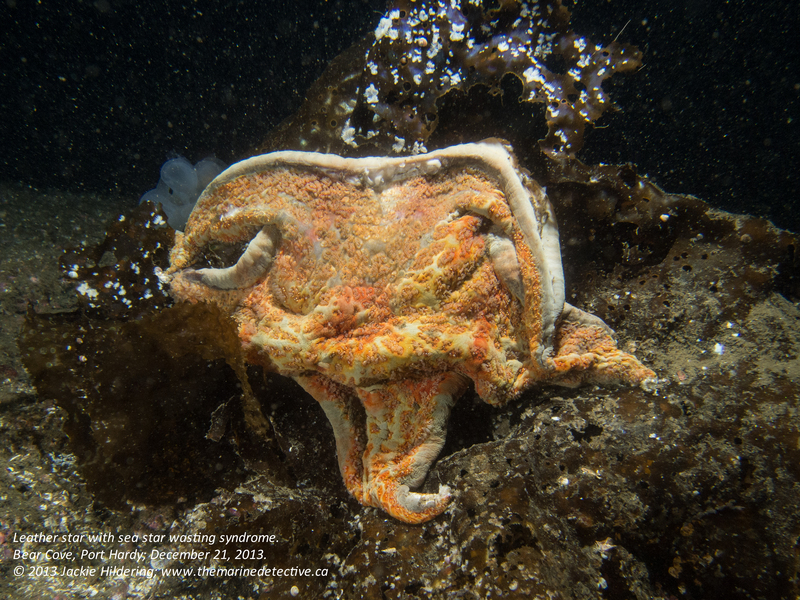 Sea Star Wasting Syndrome is a solid indicator of how little we know about our life-sustaining oceans. It emphasizes the importance of humility and precaution in decision-making around the environment and how we are all empowered to reduce environmental stressors (with emphasis on reducing fossil fuel consumption and chemical use). 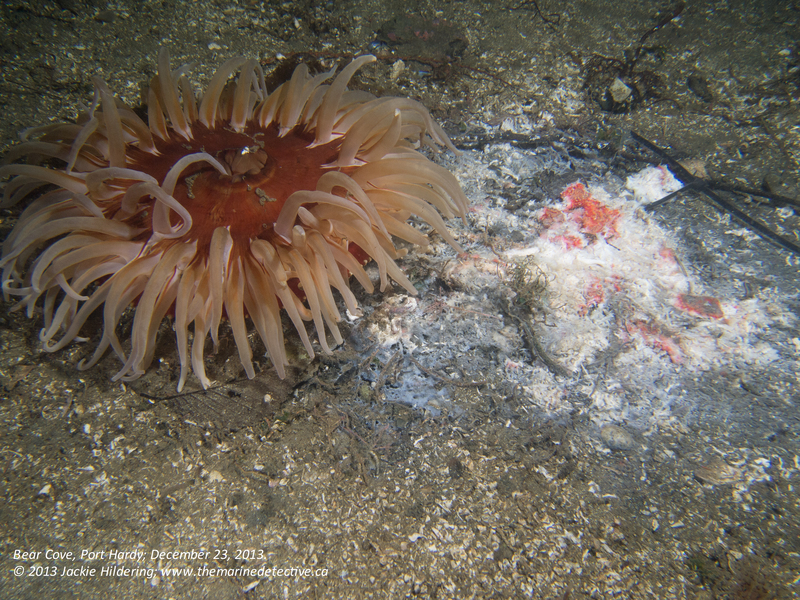 Having witnessed what I have over the last many weeks, I am all the more driven to assist others in (1) falling deeper in love with the NE Pacific Ocean by revealing the beauty below her surface and (2) feeling the joy that comes from creating change that is better for the environment and, therefore, ourselves. What was once a sunflower star. (Click to enlarge). Bear Cove, Port Hardy; December 23, 2013.
powerful post, sad story with an empowering message….thank you for all you do Jackie!! p.s. we have a golden (paper) sea star on top of our Christmas tree! we love them so!!! Thank you so much Christy. We just got to keep going . . . more paper sea stars on Christmas trees everywhere. Makes me smile Osmia . . .
paper stars sparkling everywhere bringing HOPE to all! Hello Antoinette, There is no indication that radiation is a factor in the Wasting Syndrome but indeed, a very positive approach is to ensure we reduce the stressors to the ocean. Thanks so for caring.